After a week with the Fire TV, I was confident that it was just another streamer, and our review reflects that. Amazon put a few nice tweaks on the existing set-top formula with an easy setup and voice search, but my TV stand is crowded with game consoles, dongles and other boxes that bring their own strengths. A month later, I've found that my initial experience didn't tell the entire story -- unlike other platforms that are locked down tight, letting the Fire TV languish as a Netflix/Amazon/Hulu box isn't showing what it can really do. Thanks to its (relatively) open setup and compatibility with Android apps, the Fire TV can easily extend itself beyond the usual set-top box restrictions. Whether or not Amazon approves an app, it still might run on the Fire TV -- you'll just have to install it yourself from another computer or mobile device on the same network via a technique known as sideloading. Standard Google TV boxes and even products like the OUYA have similar options, but so far haven't shown the right balance of performance, price and control to stoke my initial interest. Older Apple TV devices can have their software cracked open too, but not the latest models, and the list of Chromecast-ready apps is still short. Just like it did with the Fire tablets, Amazon left the Fire TV open to installs outside of its own Appstore. Unlocking the Fire TV's potential is as simple as marking a checkbox, but actually introducing new software is a bit more complicated. 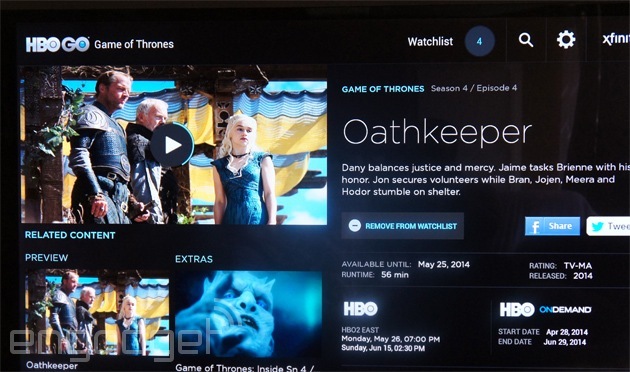 The easiest walk-through I've found is available here on the XBMC wiki. 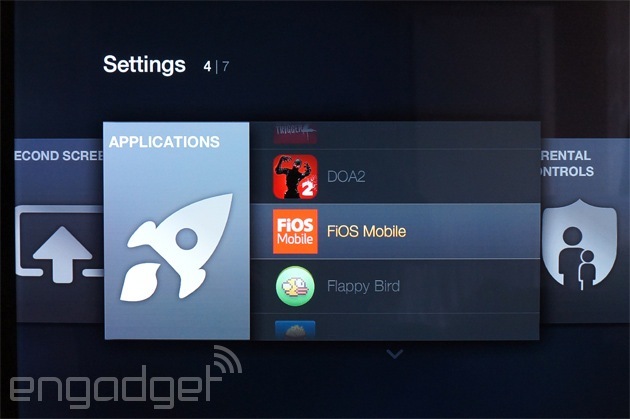 Even if you don't want to use XBMC right away, the steps are the same for any apps that you'll install on the Fire TV. Amazon also provides its own instructions, which are intended for developers to test out the apps they're building. That means setting up a software-development environment or diving in from the command line is usually necessary. For an easier way, it's possible to send apps over from a different Android device or download an easy-to-use program on your PC. Android apps are delivered in files known as APKs, and without direct access to Google Play, you've got to use one of these other options to install them. To find the files you need, Googling (name of app) + "APK" will usually work, but it's probably a good idea to keep a virus scanner handy. This process wasn't tough, and if you've ever fiddled with an Android phone, you've probably done most of the work before. Once the apps are installed, they're available under the settings menu -- until/unless the Fire TV is rooted, anything you install yourself won't be joining the other apps on the front page. My biggest problem? Finding apps that actually worked well. My first go-round with XBMC was anything but smooth, and common mobile apps like Spotify and Instagram would barely launch, pop up sideways or fail to respond to my inputs. Games are even worse, as the ones I tried didn't work with the Fire TV's controller at all. Even apps that were functional (usually, services that are Google TV-ready) didn't always perform well. However, things started to turn around with the new version of XBMC 13 "Gotham." It's built to run better on the cellphone/tablet-like ARM CPU that's inside the Fire TV, making for an improved experience that lets its various add-ons for things like weather, video and music work even more smoothly. XBMC support is key for those looking for a Plex alternative (already available in the official Appstore), and opens up extra features (AirPlay). The Fire TV has serious media chops, and we're expecting to see it crib more features from the competition soon -- through both these unofficial apps and standard ones. AllCast developer Koushik Dutta has already demonstrated video playback that pipes a second audio stream to users' phones in a way that mimics the Roku 3's headphone jack-in-the-remote trick. 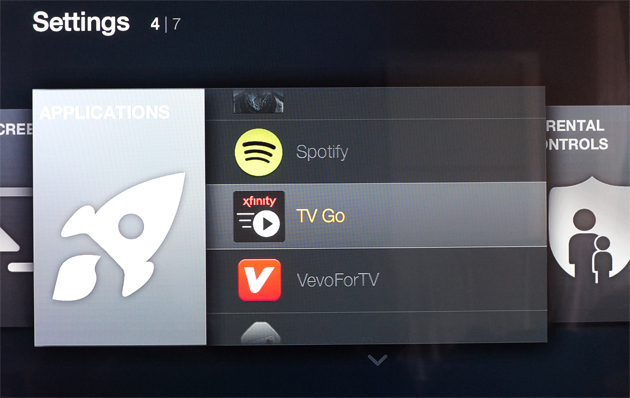 So what can you actually use on the Fire TV? Verizon's FiOS Mobile and Comcast's Xfinity TV Go both work, as does HBO Go (which will arrive natively on the Fire TV soon). An XDA forum thread also points out some of the other apps that are known to work, including Nova Launcher and BBC's iPlayer. Nova Launcher (and XBMC) can be used to launch any app you have installed, and makes getting to the sideloaded ones just as easy as any of the default options. A few popular games, like Jetpack Joyride, also work, and Firefox does too, if you want a web browser. Unfortunately, the resolution of HBO Go's streams left much to be desired. While my cable company (Comcast) blocks HBO Go on Roku's hardware, the quality (on the Fire TV) was poor enough to make this usable only as a last-ditch option for Game of Thrones. Comcast's Xfinity app pulled in HD streams of live TV and video on-demand without a problem, although the frame rate stuttered a little. The real bad news is that the Comcast, Verizon and HBO apps are all built to be controlled with a touchscreen, not on a TV. This is where the keyboard and mouse (to work as a pointer in place of a finger) came in handy. To use both at once, you'll need a USB hub. Hot-swapping a keyboard and mouse on the Fire TV's single port is possible, but doing so can create problems, like causing HBO Go to reset. Some folks have also had success with keyboards that have a touchpad built in, like those from Microsoft and Logitech. If you want to dig deeper, some users have worked out ways to fix unruly games and apps that either don't recognize the correct rotation for a TV or need extra help for controls. There are a number of Android set-top boxes out there, and you can even load your own software on most, but the Fire TV combines that ability with top-of-the-line hardware and an easy-to-use UI. Right now, the main draw for loading your own software is its ability to run XBMC. I think it has enough horsepower to mimic any exclusive features of other boxes given the right software. With any luck, developers will take advantage soon, and maybe the competition from Google/Apple/Microsoft will follow Amazon's lead and let users decide how we want to use our boxes.